In this four year Italian study, the effectiveness of an integrated homeopathic treatment approach in respiratory allergic conditions was shown with marked reduction in allergic symptoms, reduced conventional drug use and improved quality of life. Patients referred to the Pitigliano Integrated Medical Centre, in Tuscany, with seasonal and perennial respiratory allergies (eg. asthma, bronchitis, rhinitis or oculorhinitis) were treated with individually tailored therapeutic and constitutional remedies. Therapeutic remedies are based on the specific pathophysiological symptoms of the allergy, and the constitutional remedies, designed to support the ‘totality’ of the patient, are based on more general symptoms and patient characteristics. At first follow-up, after 2 months of treatment, 75% of patients with seasonal respiratory allergies showed a high level of improvement, with many patients experiencing complete resolution of their symptoms. These improvements were maintained throughout the 2 year follow-up period. Forty five percent of patients with perennial respiratory allergies showed similar levels of sustained improvement in their symptoms. Compliance with treatment was high, with many patients returning for further homeopathic treatment of other conditions. No adverse reactions were reported. Conventional drug usage was significantly reduced by the end of the 2 year follow-up period. All patients with seasonal respiratory allergies had reduced their consumption of cortisone, bronchodilators or antihistaminic drugs to zero whilst patients with perennial allergic syndromes had reduced their conventional drug usage by 85 to 100%. The significant reduction in cost of treatment was also noted by the participants. These results confirm our general experience of the benefits of homeopathic healthcare in hayfever, allergies, seasonal and perennial respiratory allergic conditions. Thank you to homeopath Jacqui Harrison for this summary of allergies, hayfever and homeopathy research. The setting for this Homeopathy research into allergies, rhinitis and hayfever was the hospital in Pitigliano (Tuscany). 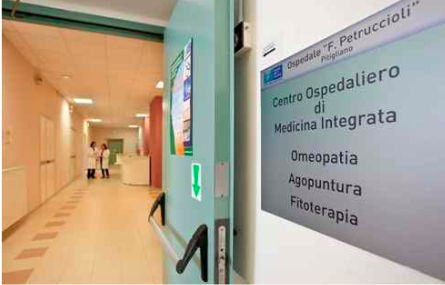 It is the first hospital in Italy to put into practice a model of Integrated Medicine. This clinical setting caters for the use of complementary medicine (homeopathy and acupuncture (針灸 zhēn jiǔ)) alongside orthodox therapies (conventional medicine). This innovative setting has doctors who are experts in complementary and alternative medicine and the rest of the hospital personnel working together as equals. Ferreri R, Bernardini S, Pulcri R, Cracolici F, Rinaldi M, Porciani C. Improved quality of life and reduction of conventional drugs in allergic patients treated with homeopathy. HRI Research in Focus, Issue 31 Summer 2016. Bruera E, Kuehn N, Miller MJ, Selmser P, Macmillan K. The Edmonton Symptom Assessment System (ESAS): a simple method for the assessment of palliative care patients. J Palliat Care. 1991; 7(2): 6-9.